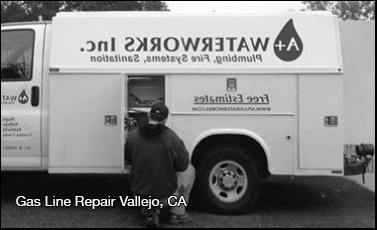 Gas Line Repair Vallejo, CA | A+ Waterworks, Inc.
Gas lines help keep homes dry and comfortable. When your home needs gas line repair in Vallejo, CA, your tasks get inconvenienced and your health is threatened. That is why you should call a reputable plumbing company for A+ gas line repair in Vallejo, CA. At A+ Waterworks, we execute our work with a focus on long-term benefits and our clients’ satisfaction. Whether you need help with pipe installation or gas line repair in Vallejo, CA, we have the experience to bring you optimal results. Gas lines transport gas from the main supply to appliances. Because of these pipes, your stove, fireplace, and other units are able to function. That is why immediate gas line repair in Vallejo, California is necessary if your pipelines are damaged. When the issues are left unresolved, they can cause further damage to your home. If you need gas lines repair in Vallejo, California, A+ Waterworks is fit for the job. We invest in rigorously trained team members and top-quality equipment to provide excellent results. To have our reliable specialist perform gas line assistance in Vallejo, California for you, you can call us for a consultation. Your stove, heater, and other appliances need a stable supply of gas to work properly. An interruption in this flow can keep you from performing regular tasks and put your family under serious threat. To prevent this, you should learn the signs you need gas line repair in Vallejo, CA. You may need gas line repair in Vallejo, California if you see hints of a gas leak. To learn whether you need gas line service in Vallejo, California, check your surroundings. Do you smell, hear, or feel there is a gas leak in your property? If yes, it may be time to call in the professionals. By inspecting your gas line area, you will learn when your gas line leaks in Vallejo, CA. Plants near gas lines start to decompose when a gas leak is in place. Condensation buildup is also an indication you need gas line repair in Vallejo, CA. If you notice any of these on your property, do not hesitate to call our professionals to address your potential need for gas line repair in Vallejo, CA. You may need gas line repair in Vallejo, CA if your appliances are malfunctioning. See if you need gas line repair in Vallejo, CA by inspecting appliances that are hooked to your gas lines. If they make uncommon noises and function without their usual efficiency, gas line assistance in Vallejo, California may be necessary. Failure to notice gas lines leaks in Vallejo, CA when one is happening may result in gas appliance breakage. You may need gas line repair in Vallejo, CA if there is a sudden spike in your bills. Is there an unexpected increase in your gas bills? Check your pipelines. You might need to contact a professional for gas service in Vallejo, California. Pipelines that need gas line repair in Vallejo, CA tend to consume more gas than necessary. To save yourself from additional expenses and danger, give us a call. We will perform A+ gas lines repair in Vallejo, CA for you. You may need gas line repair in Vallejo, CA if you start feeling unwell in your property. Do you need gas leaks service in Vallejo, CA? Our A+ workers are ready and willing to help you. Learn more about A+ Waterworks by visiting www.apluswaterworks.com.